Three others joined me for this scheduled trip, on Memorial Day weekend, to make another peak and hike in the central Great Basin. We left after work Friday to drive along U.S. 50 to the vicinity of Austin, Nevada, again. Saturday, going east a bit further, we took Highway 376 south down the Big Smoky Valley to come, in 45 or so miles, to the dirt road signed South Twin River. It leads west to a primitive trailhead parking area, up against the foot of the range. I had my Sierra Club guidebook, Hiking the Great Basin, by John Hart. This proved a very useful book to me, with ideas and correct descriptions for several climbs and hikes. I am credited for some information in the latest edition. I had sent a letter to the author, with some clarification on route details. We began hiking up the South Twin River on a gated dirt road. One climbs up the dirt road to a hill. Then, one drops, along the dirt road, into a beautiful canyon. There are several stream crossings, which we just sloshed through. One hiker went for a fully clothed swim! There is a kind of narrows, then more cliffs. Passing some big mining equipment, we detoured a bit to go to the log cabin at a far meadow off the trail. It was still there, so we explored the area. Going back to the trail, we came to a sign that told us exactly where we were, by the map. Leaving the South Twin Canyon, we headed over a small pass and hiked through groves of still bare-leafed aspen. Descending, we hiked along the trail to go through the more rugged North Twin River Canyon. We had more stream crossings, then the canyon became deeper and cliffy. The guys wanted to know how much further it was. The total hike is said to be "about 13 miles (Hart)." We still had a way to go. The mountains above us had snow in the gullies, just as the guidebook said. I kept assuring the others that we would be coming out of the canyon soon. But, we had to keep going, as we came to bends in the canyon where I thought the hike would end. Two miles from the parking, we came upon a famous, Sierra Club, local chapter, leader. He was sleeping under a tree. After noting that he was leading an overnight backpack group, we came upon his group, later, further down canyon. They were agitated that the leader wasn't with them, having left them for the cougars or the coyotes. I told them that he was dozing to get away from the group's manner. He says he likes solitude, and gets it even when large numbers of hikers are following. He told them that he was going ahead to scout, and to wait as directed for his return. Finally, as the sun lowered, we came to the end of our canyon hike. It is a shorter, mile or so, walk back to the parking for the South Twin River. We drove back to car camp at a rest area in Carvers, NV, a small wayside. I think I got dinner in the cafe here. The next day, me and my carload of two were off early to drive to Manhattan and Belmont, two "ghost towns," that provided plenty of historic interest. They were relics of a gold mining era, but with some operations still ongoing. We visited a bar for drink and I took pictures of the colorful, decorated interior. These two were enjoying this. Continuing on my memory and maps, I navigated on dirt roads to the roadhead for Mt. Jefferson. We parked, and then, for us, it was a hike at your own speed, just head up, sort of day. The sky was clear, and the summit plainly in view. A dirt track led up toward the peak, then cross-country travel up over rocky ground led us to the top. 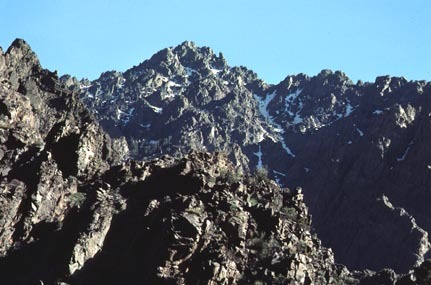 The true summit is located on our, south, side of a long plateau. The other, lower, north summit is two miles away. A festoon of antennas out of a structure marks the top. We enjoyed the view and looked through the register. 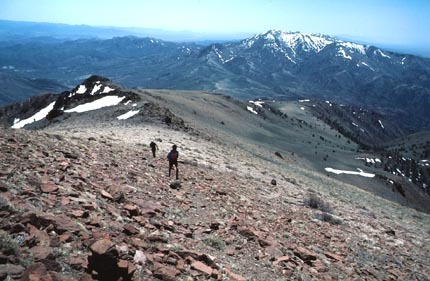 On the east side somewhere, a recent archaeologic find of an ancient village was said to be the highest living area, at 11,000 feet, in the U.S., for primitive man. Called Alta Toquima, someday, I'd like to see that. With plenty of time, we descended by the same route up. I took pictures of us with snowy Spanish Peak (10,916') in the background. Back to the car early, we had time now to explore a rock cabin seen enroute. Getting back to the main dirt road along the east side of this Toquima Range, I headed north at good speed. There are some points of interest shown on my topo. I drove the car up to the rim of Dianas Punch Bowl, a large crater, or hole, with water in it. It is supposed to be hot. I took plenty of pictures, as few persons must ever come here. Another sight was a mountain called the Monitor, named after the Civil War ironclad ship. The formation bore an incredibly good resemblance to what I remembered from history books! We then came to the dirt road over Pete's Summit. A petroglyph site, Toquima Caves, is a short hike off the main road. It is fenced to protect it, and I took photos with my flash unit. Rock art has become a favorite subject for my photography hobby. Our last stop for the day was Spencer Hot Spring. This is a small shack built with a pool, or tank, of geothermal, warm water inside. Two others were already soaking, but the guys had to get in. While hot springs are much nicer in the winter, we enjoyed them while we were here. It was the late evening of such a glorious day in the Great Basin. With the hiking done, I thought just to get home earlier. I drove west on U.S. 50 to the vicinity of Fairview Peak, and the earthquake fault, to car camp. Monday, we looked at the five foot displacement along the escarpment of the range. It would have been a big quake to move the ground that much. The rest of the trip was spent driving home. This, unbeknownst to me then, was my last official Nevada trip for the local chapter. The participants enjoyed the hikes and scenery, and I think we could have had more trips. This Memorial Day weekend tradition was to stop, as I was effectively barred from the outings leader pool, by chapter executive order, even. While we did private trips later, there would be no way that interested hikers could join us, except to know about us, somehow. I tried to advertise, but it's not as good, then, as a scheduled Sierra Club activity. Participants may know, on an official trip, that there is some insurance, so they could try to sue and collect big money if a major wrong is done. It's good to have someone to pay for negligent leadership or poor chapter policy. There is seemingly malicious intent, at least locally at one time, by some accorded authority. The insurance and waivers are good protection for the Club against this.